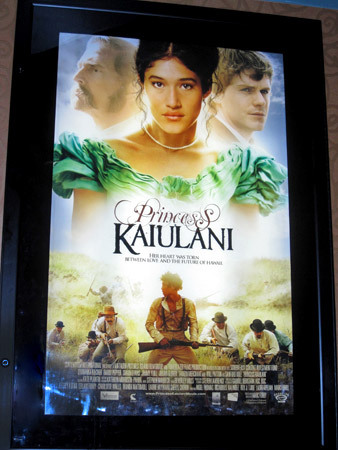 The movie poster for Princess Kaiulani on display at the Consolidated's Kahala & Ward Theaters in anticipation of it's May 14 release here in the islands. It might not be Iron Man 2, but the local release of Princess Kaiulani next week Friday, May 14 is nearly upon us. Back in October there was a lot of attention being drawn towards the film, particularly because: 1) it was a depiction of a historical Hawaiian figure shot here in Hawaii, 2) it was going to get it’s first on screen, real audience appearance at the Hawaii International Film Festival, and 3) it’s former name, ‘Barbarian Princess,’ was not sitting well with many locals and those in the Hawaiian community. As such it debuted at HIFF to record crowds, so much so that additional screenings were added to fill the demand. With such an enormous amount of hype and hoopla surrounding the film’s debut at HIFF, I’m actually kind of surprised there’s not more attention being drawn to the film now that distributor Roadside Attractions is going to give the film a limited release here in the islands and in select theaters across the country (Los Angeles, Las Vegas, San Diego, San Francisco, Phoenix, New York–with the possibility of wider expansion to follow). At the time of HIFF in October, I was a little skeptical that anyone would be able to see this picture outside of the film festival circuit. To my knowledge no other feature film about Hawaiian history had ever been shown in theaters (Michael Bay’s Pearl Harbor doesn’t count). I mean, what kind of market is out there for a movie like this? Obviously this is going to play to the indie film niche, but would people outside of Hawaii be interested in seeing this? Never the less, I’m still rather excited that this film is going to get an honest to God theatrical release. I wouldn’t be surprised if it even gets reviewed on At The Movies. One noticeable difference between the film then and now is the obvious title change. As I mentioned earlier, during production and at HIFF the film went by it’s original title, ‘Barbarian Princess.” After being picked up by Roadside Attractions I guess they felt that the title needed to be changed. During HIFF I crafted this post which advocated for keeping the title as is because I believed (and still do) that the juxtaposition of the title with what is shown on screen will make people think and ultimately realize that she wasn’t wasn’t the title, or her critics during that time, labeled her as. Biased or not, I think the trailer sells the movie. All that’s left is for everyone to go see it!